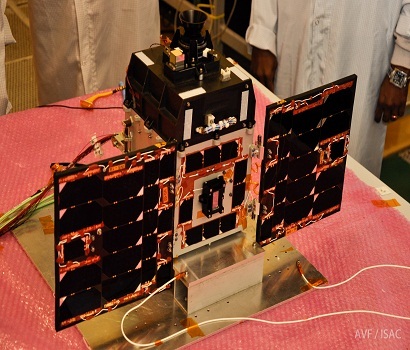 INS-1C is the third in a series of Indian Nano Satellites based on a new, versatile satellite platform developed by the Indian Space Research Organization to host a variety of experimental payloads for short-duration demonstration missions. Employing a highly modular design, INS can be fitted with a variety of payloads for technical demonstrations and scientific missions. 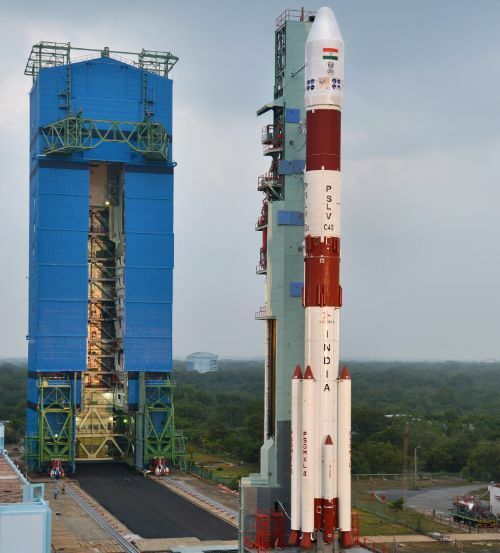 ISRO hopes INS will provide an opportunity for developing countries to put their payloads into orbit aboard a cost-effective satellite platform that can be launched relatively cheaply as a secondary payload on the PSLV rocket. INS has been designed with a platform mass of around 5 Kilograms, capable of facilitating payload of up to 5kg with standardized structural and electrical interfaces. Typical INS mission durations are six months to a year. The INS-1C satellite is 24.5 by 22.7 by 21.7 centimeters in size and weighs 11 Kilograms. Two deployable solar arrays and body-mounted solar cells deliver around 27 Watts of power, directed to a 11.2 Amp-hour Li-Ion battery and distributed to the various users on the satellite. Attitude determination is accomplished through a combination of sensors including a MEMS IMU, Micro-Sun Sensors and a three-axis magnetometer while a star tracker provides precise pointing knowledge after initial attitude stabilization; actuation is provided by reaction wheels and magnetic torquers with an overall pointing accuracy better than 0.5° on each axis – sufficient for many Earth-imaging or technology demonstration missions. The INS platform supports an onboard memory of up to 8GB in the form of an SD Card and payload data playback is available at a data rate of 1Mbps via S-Band while commanding and telemetry exchange is handled in VHF and UHF, respectively. INS is rated for an in-orbit life of six months – sufficient for most technology demonstration missions launching on a budget. 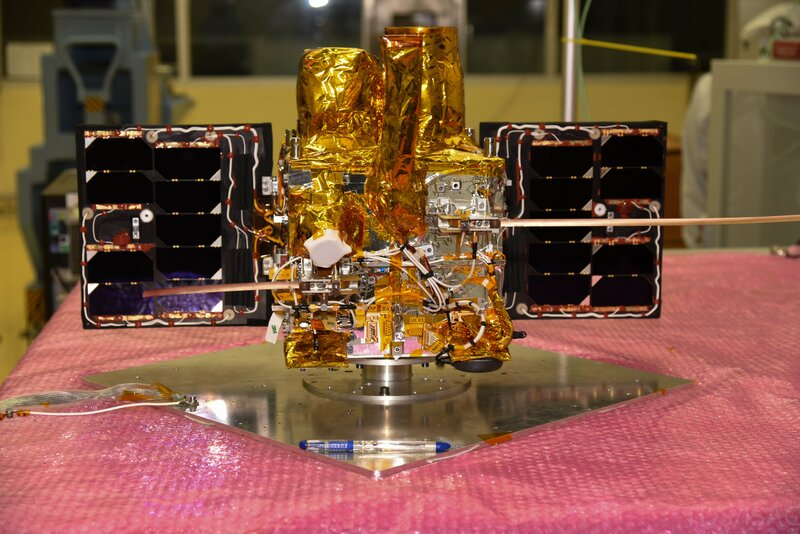 Two INS satellites were launched on the PSLV C37 mission in February 2017 with the major objective of demonstrating the INS satellite platform in an operational environment to make the bus available for future flight opportunities. INS satellites use the same box-shaped bus module that provides the satellite’s core functions such as power generation, attitude control, and data handling. On the top side of the platform structure sits the payload module that facilitates the experimental senors and their electrical support systems. 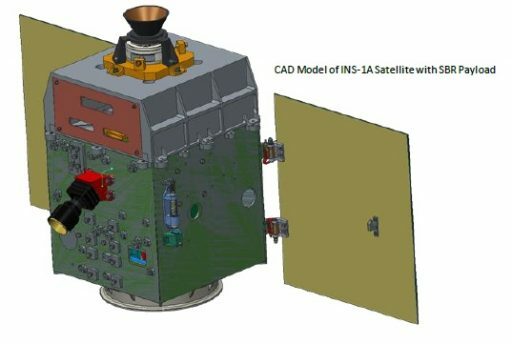 The INS-1A satellite hosts a pair of compact payloads: a Surface Bidirectional Reflectance Distribution Function Radiometer (SBR) for the collection of BRDF correction data relevant for Earth Observation missions and a Single Event Upset Monitor (SEUM) to study the effects of space radiation. INS-1B flew a Earth Exosphere Lyman-Alpha Analyzer (EELA) to measure atomic hydrogen in near-Earth space and an Origami Camera as a compact imaging system for nano satellites. The Payload of INS-1C is the Miniature Multispectral Payload Technology Demonstration (MMX-TD) from Space Application Centre.